The following below are our main desserts that we customize and make for our amazing clients. If you're looking for something outside the box or that is not listed, please feel free to contact us and we'll be sure to accommodate to your needs for your special occassion! Food on a stick? Check! Now you can have your cake, and eat it too. Crumbled baked cake, mixed with frosting, shaped into balls or other various shapes then dipped in chocolate and decorated with various sprinkles or decor. No plates needed! Drip baby, drip, common now, drip baby drip. 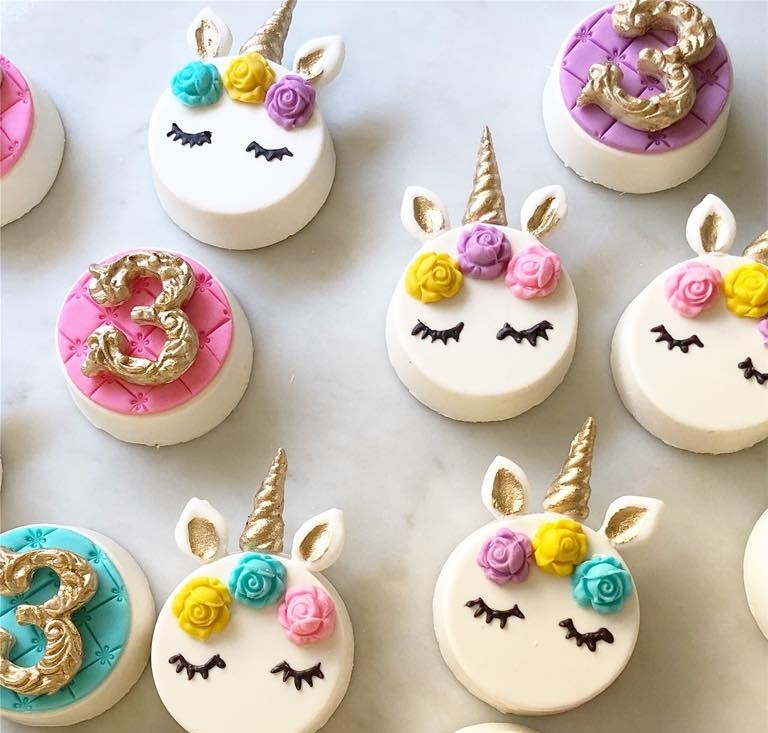 What a better way to dress up a cake, than with some fun and colorful drips! 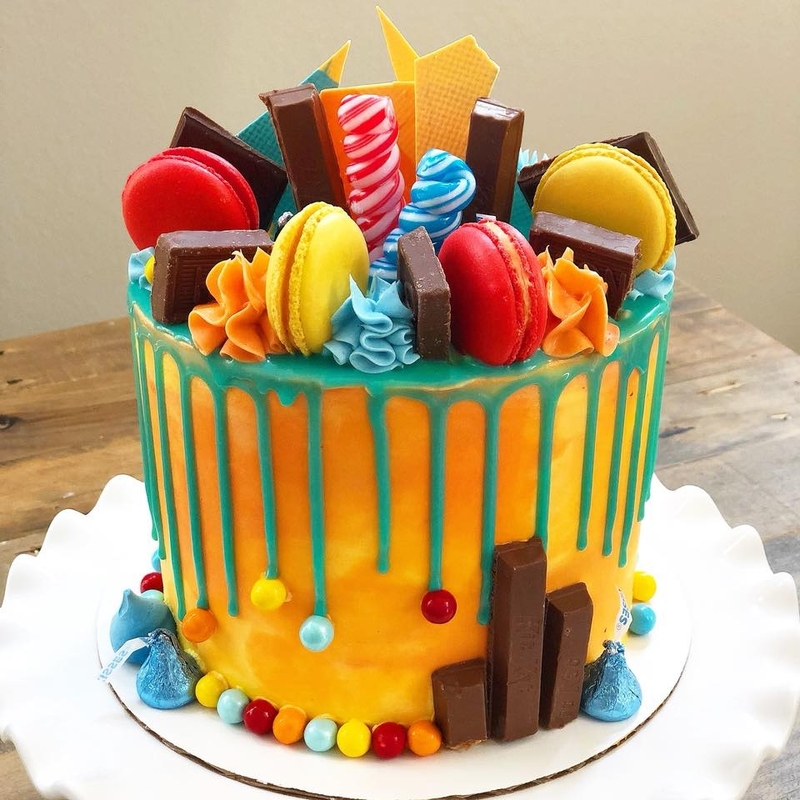 Round buttercream cakes, dripped with chocolate, topped with macarons, candy bark and other sweet treats for a fun show-stopper. We also do themed cakes! What a statement dessert! A definite show stopper that can be classy any fun! Two large almond cookie stacked in the letter or number of your choosing. Topped with macarons, meringues, fresh fruit, decorated in fresh flowers on top of a mascarpone whipped cream filling. Delicate French "cookies" made with almond flour, meringue and powdered sugar. 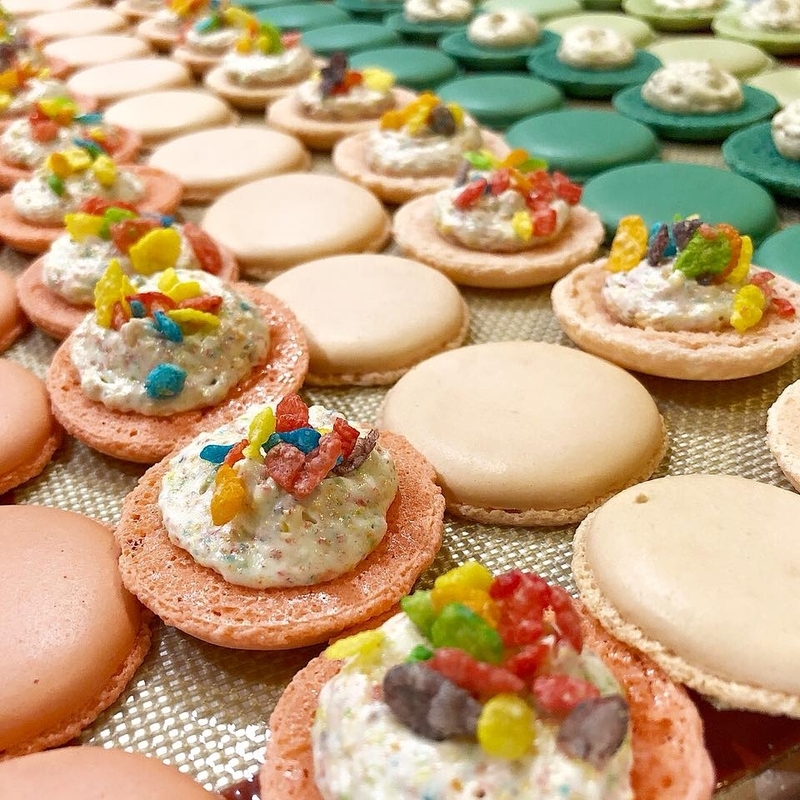 Classic macarons for a purist or customized for a new twist on an old classic. What's better than an oreo? One covered in chocolate. These Oreos are covered in chocolate and make for an amazing presentation. 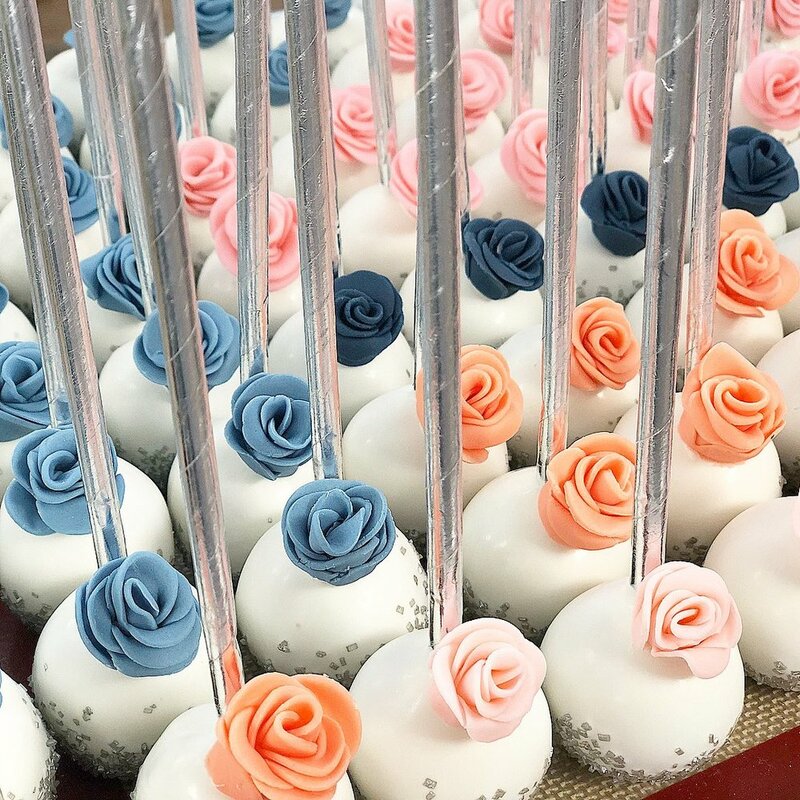 From weddings to birthdays, put your own twist on them or keep them classic and drizzled with chocolate. Either way, you can't go wrong. Who can say no to cookies? Soft, chewy and baked just right. These are your classic sugar cookies decorated with royal icing or covered in fondant. Kid and adult friendly! 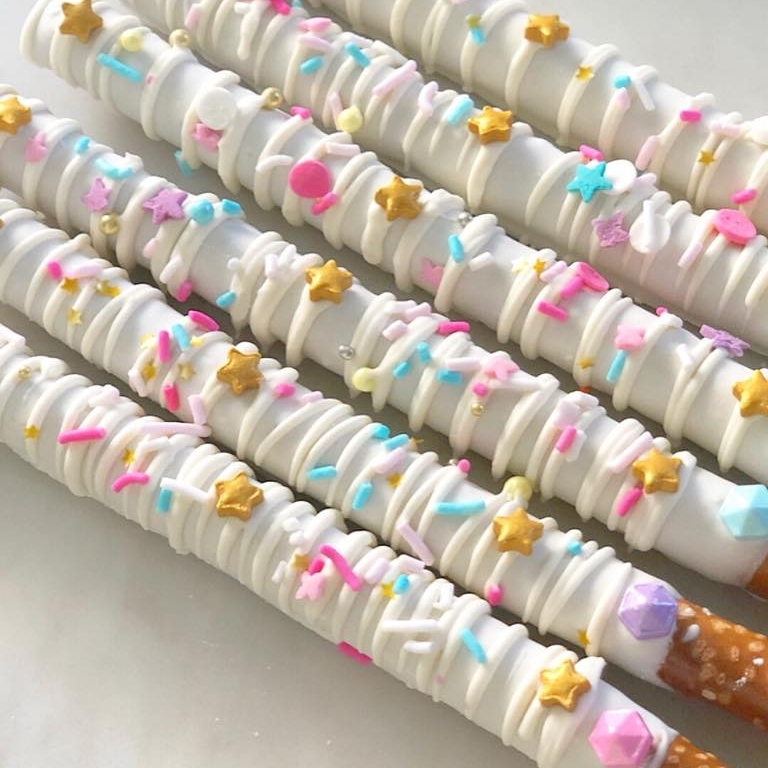 These pretzel rods dipped in chocolate, drizzled with chocolate and decorated with various sprinkles. Want a fun way to eat your fruit? Dip them in chocolate! Strawberries dipped in chocolate, then drizzled with chocolate and sprinkles. Can also be customized to your theme! Oreos.. Check.. Cream-cheese-check. Now crush them up and mix them all together and what to you get? These delicious truffle balls dipped in chocolate are a crowd pleaser! They are called Chubby hubby's for a reason. To give your loved ones more cushion around the middle section. These treats are crushed Pretzels mixed with peanut butter and covered in chocolate for a salty sweet combination. You can't eat just one! Kids & grown-up approved. Rice cereal mixed with melted marshmallows, shaped into classic blocks or custom shapes. Rice Krispie Treats are dipped & decorated in chocolate and are a childhood treat that will stay with your for a lifetime.